Hi, all! 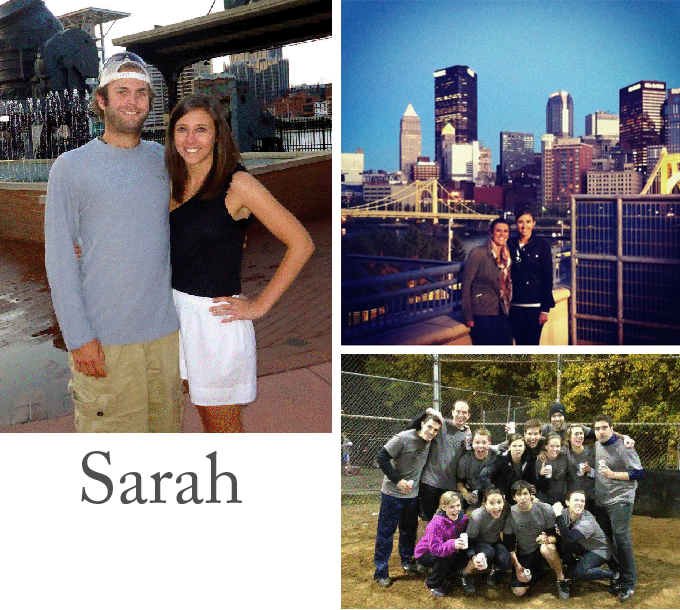 I’m Sarah, and “The Pitts” is my own little crazy corner of the blogging world. I’m a mid-20’s real-world’er who just moved to Pittsburgh, and my blog is all about my journey to discover Life, Love and Happiness in the Steel City! Moving to a brand new city for work and love was an unexpected surprise, and I share my stories of the ups, the downs, and the Yinzers on The Pitts. Hoping to settle myself in my new surroundings, I've also taken up documenting and reviewing local restaurants, places and events that I experience first-hand, not to mention my adventures in Kickball. I need to learn the ropes somehow! My blog is a happy mix of stories, DIY projects, cooking successes (and failures), and all-things-20-something. Stop by to follow along, cheer me on, and simply laugh as I find my place in the Land of Yinzers! So head over and check out her blog and send her some love. And check out her other social networks as well. So stop by and say hi!